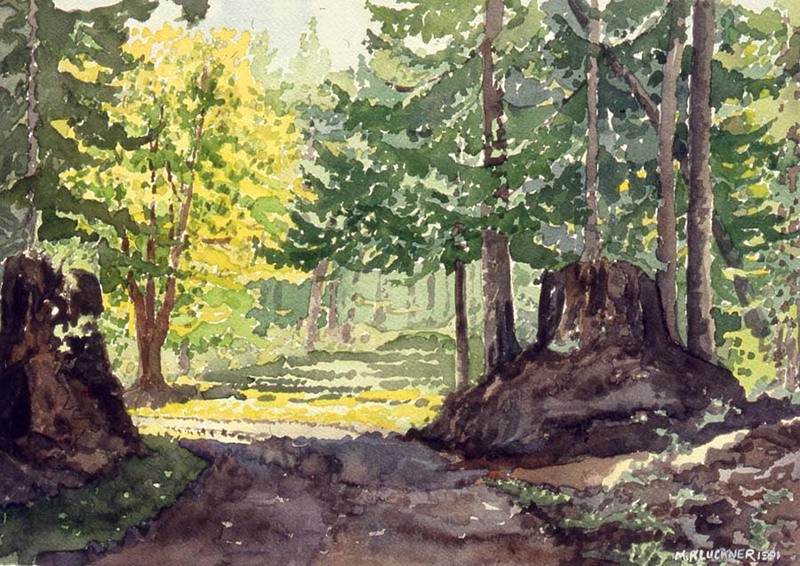 I was prompted to put up this page of my watercolours from 1989–1992 after showing them to the Bowen Island Historians at their AGM in June, 2016. 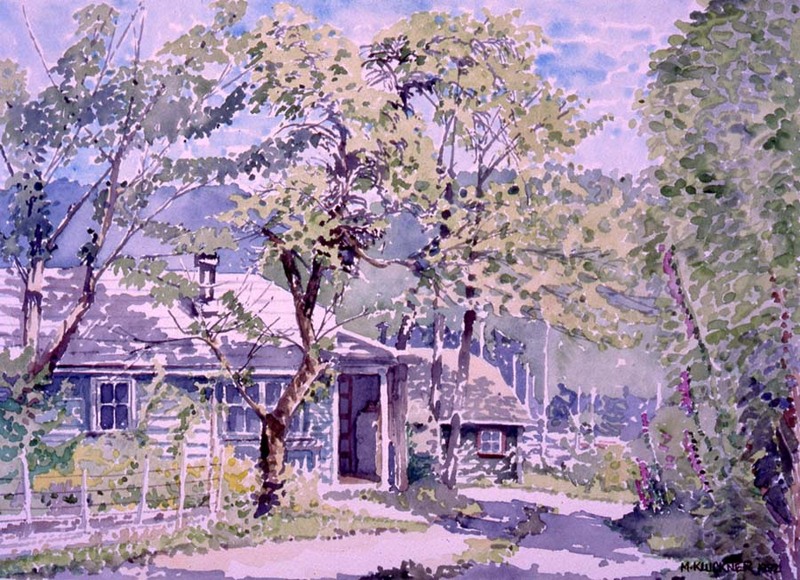 The talk began with the images below of cottages in Davies Orchard at Snug Cove, whose future is in doubt because Metro Parks wants to remove them to create more "natural open space" – a similar situation, although with different kinds of tenancies, to the one at Belcarra. Old buildings with managed tenancies and maintenance needs appear to create problems for park administrators who would have to think outside the box and adopt a different attitude toward public liability; an advantage to retention, other than the cultural one of keeping the historic landscape, is the "eyes on the park" that residents would provide. 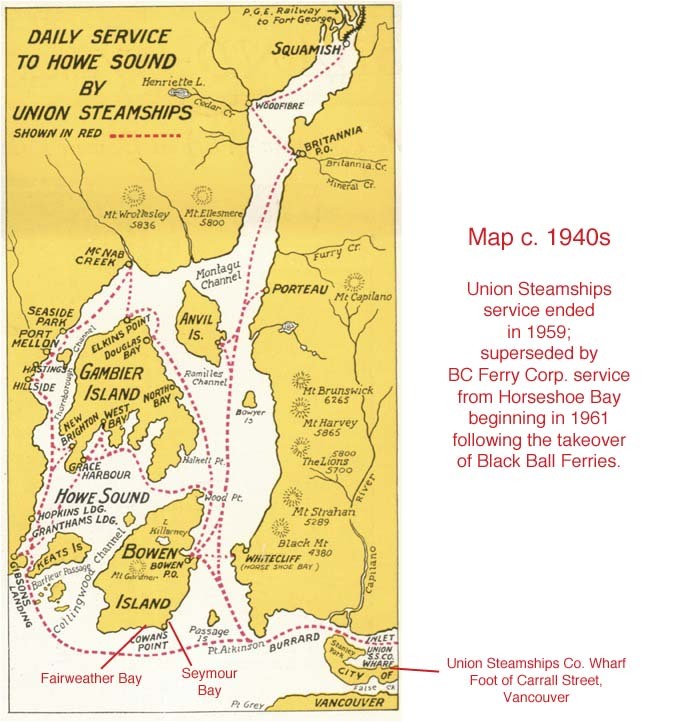 Above: Howe Sound and Bowen Island in an earlier era; a Union Steamships boat stopped at Seymour Bay twice a week to service the southeastern corner of the island – sojourners including Malkins, Cowans and Rogerses on the properties strung along the shoreline west of Cowan's Point. This was the part of Bowen I came to know very well due to my friendship with Janey Gudewill, a granddaughter of B.T. Rogers, described below. 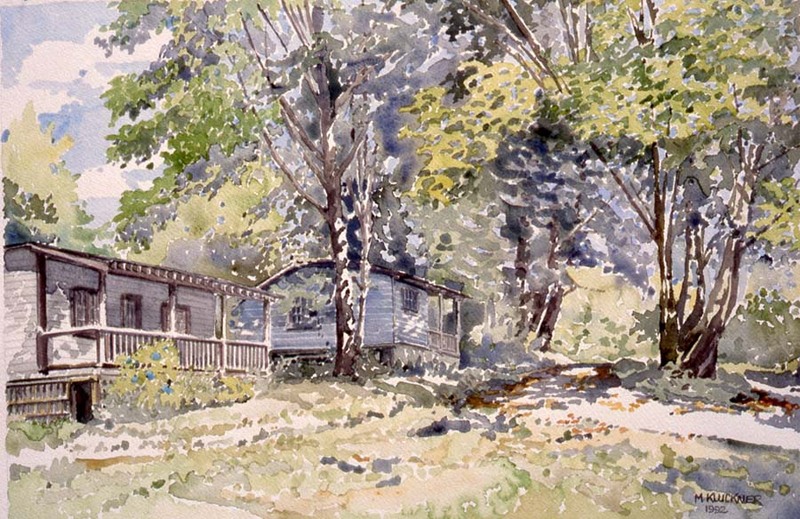 Cottages in Davies Orchard, as they were 25 years ago when the site was much leafier. 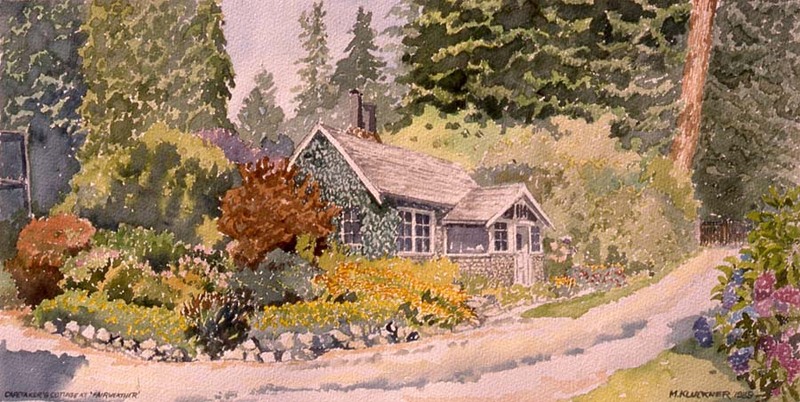 In the heyday of Bowen, there were about 200 of these modest rental buildings – simple side-gabled cabins with an integral porch, horizontal board siding, casement windows and the characteristic jerkinhead roof of the interwar Arts & Crafts style (very common, for example, on Vancouver houses of the 1920s and 1930s). They are rustic and "folk" but, with their consistent design, form a little heritage area, very evocative of their time and place. 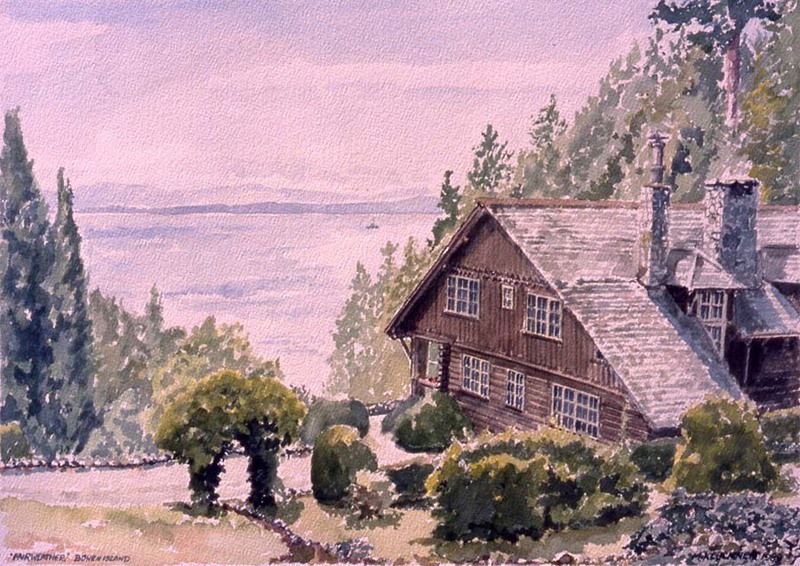 They are the survivors of 20 built in 1928 and usually rented weekly, according to "Bowen Island Reflections," page 81. About 180 cottages, built beginning in 1922 in the Alder Grove and Seaside areas north of Government Road, have been demolished as far as I can tell, although a few may survive as the core of larger dwellings. The southeastern corner of the island, now dotted with large homes and a golf course at Seymour Bay, was heavily wooded when I knew it around 1990. A narrow gravel roadway wound along from Seymour Bay to Fairweather Bay, passing the lightning-killed Douglas fir with the eagle's nest – this is the route shown below as "Janey's walk." 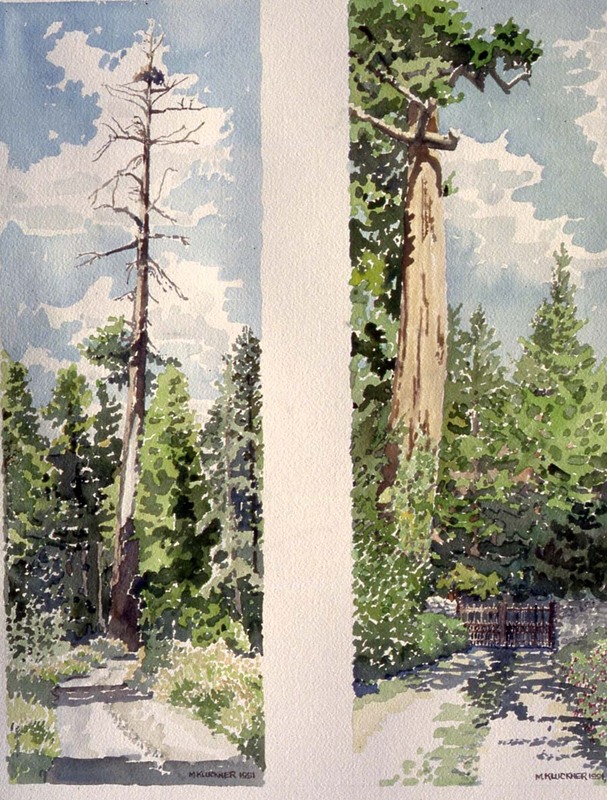 The watercolour on the right above is the old cedar tree at the gate into "Fairweather." I got to know this area because of meeting Janey Gudewill, granddaughter of Mary Isabella Rogers (widow of B.T. Rogers of BC Sugar), whose son Ernest (Janey's uncle) married Irene Cowan in 1922. Irene's father and mother, George and Josephine Cowan, had bought 1,000 acres in the area that became known as Cowan's Point in 1899. Cowan was a lawyer closely associated with the Conservative party, and had been named a Q.C. by the Tupper administration in 1896 – an honorific subsequently revoked by the Laurier government. 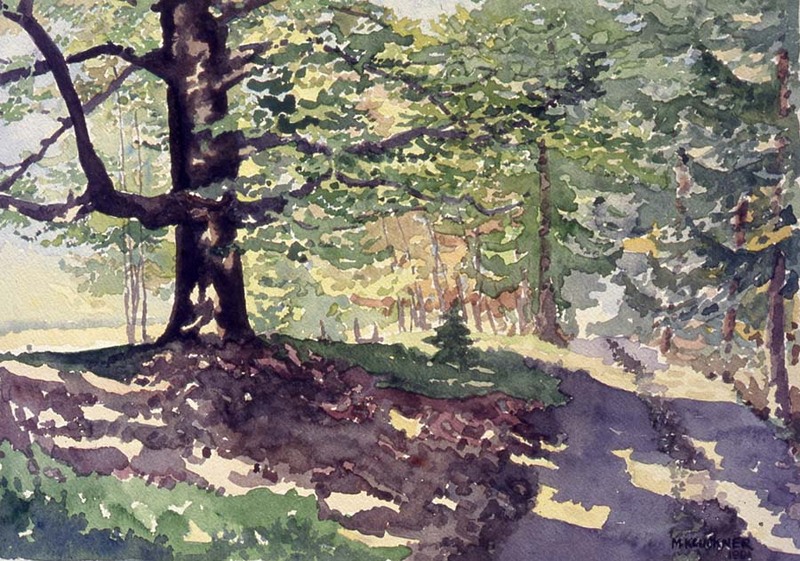 In that era of predominantly Liberal federal governments, Cowan had not prospered, and his Bowen Island land became a source of continual financial grief as he struggled to make mortgage payments. From Vanishing Vancouver (1990): "In the summer of 1922, Cowan's daughter Irene married Ernest Rogers, the second (but eldest surviving) son of the late B.C. Sugar Refinery owner. 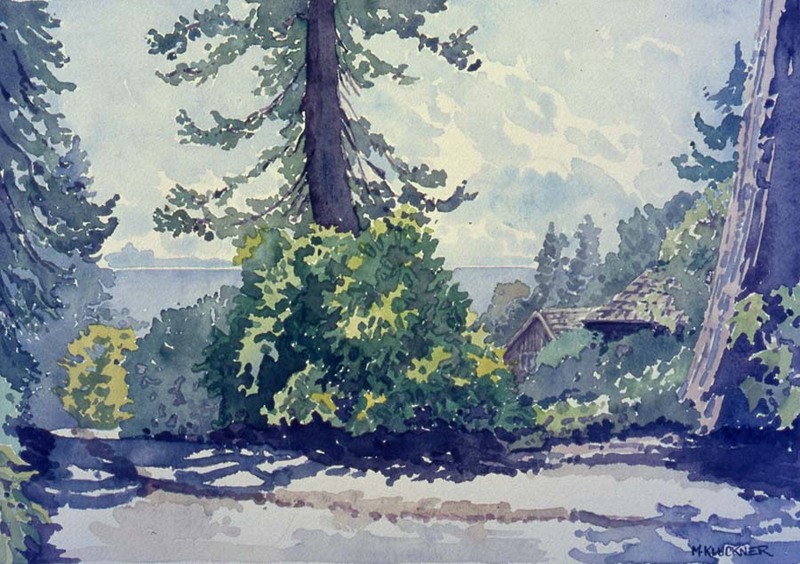 As a wedding present to them, Cowan drew 'some lines on the map of his Bowen Island property,' dividing off a piece of land on which Ernest built a cabin called 'Peterout.' 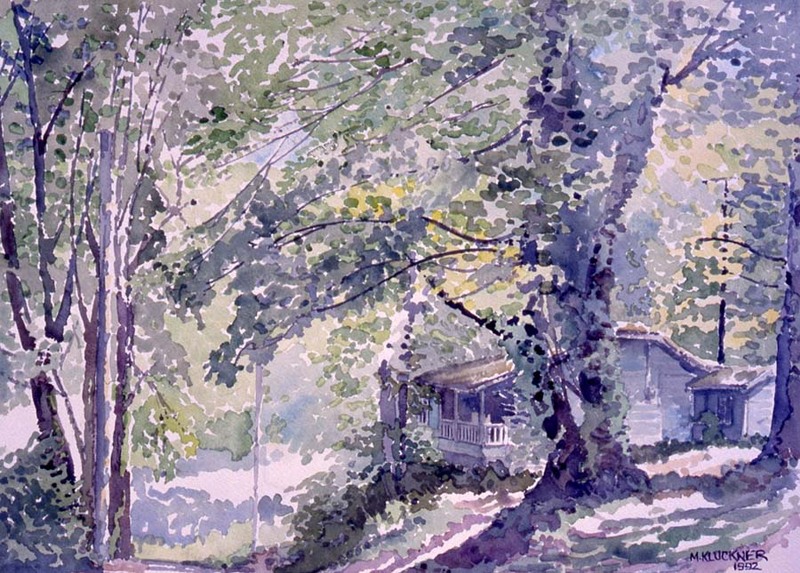 The nickname for Ernest's cabin came from the feeling in the family that his enthusiasm would 'peter out'; however, several years later, Ernest was still enthusiastic about his summer place. Late in the autumn of 1929, Cowan's mortgage on his Bowen Island property, held personally by the Canadian Pacific Railway president Edward Beatty, was called, and Cowan had no money to pay it. Ernest's mother, the widow Mrs. B.T. Rogers, had little interest in rural property in general, or in Bowen Island in particular, but after some lobbying by members of her family she wrote in her diary on December 10, 1929: "I decided to buy the Cowan Point property, and change the name from Winnipeg to Fairweather Bay." She bought the land – 234 acres on the western end of Cowan's waterfront holdings, sight unseen– for the value of the outstanding mortgage. 'Fairweather' was her mother's maiden name." Mrs. Rogers immediately engaged the architect Bernard C. Palmer to design a summer house, and Charles Bentall's Dominion Construction to build it on the steep slope above the bay. The logs were sourced at Roberts Creek and all in place, having been hauled up from the beach by a steam donkey engine, by March 1, 1930. Construction proceeded quickly, helped no doubt by the fact there was little work elsewhere due to the Depression. 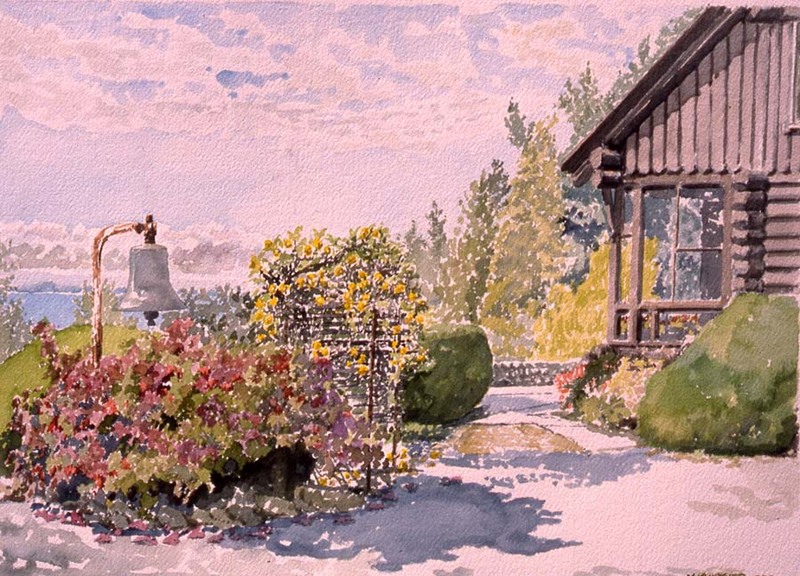 The house contains nine bedrooms – the watercolours below, all done as commissions for the family, give an indication of the scale of the property. The bell is from one of the sailing ships that delivered raw sugar from Fiji to Vancouver, c. 1900. The caretakers' cottage, built by 1930s-era caretaker George German using stones found along the shoreline. "The boat [the smaller ones like the Lady Pam and the Capilano] left Vancouver at two in the afternoon on Friday and an hour and fifteen minutes later it would arrive at Seymour Bay. Then people piled into trucks or, in most cases, they walked to their cottages. On Sunday evening at six or seven it would call in at Seymour Bay [from Roberts Creek and beyond on the Sunshine Coast] to take the people back to Vancouver by about nine. You either came up Tuesday and went home Sunday or came for the weekend, unless you had your own boat..."
"There was a telephone at 'Fairweather' – a party line. There was one line strung from Snug Cove to Cowan's Point. Uncle Ernest had a phone, the Cowans had a phone, and the Malkins had one, too. Ours was three long rings, Peterout was two long rings, Mrs. Cowan's was one long ring, and the Malkins' was a long, a short and a long. Our phone had a separate earpiece and it was attached to the wall in the dining room, and when it rang you could pick it up and listen in on anybody's conversation ... In order to get a line off the island, we had to ring a long and two shorts by hand crank on the side of the phone. That picked up the store at Snug Cove where someone would say, 'Number please' and connect you, if you were lucky, with a number in Vancouver. Your phone call might be, 'please bring more meat,' or something like that. "Every summer we rented a cow from the Lister dairy farm near the centre of Bowen Island. There was no other way to get fresh milk and cream. Mr. German walked it over on the old road and it lived in the pasture behind the house. Mrs. German had an old-fashioned, hand-powered milk separator, which was kept by the back door, and spent time every day separating the milk from the cream and the buttermilk, although I don't think she churned butter. In the fall, Mr. German walked the cow home – a trip to the farm and back up that steep hill took him the whole day." 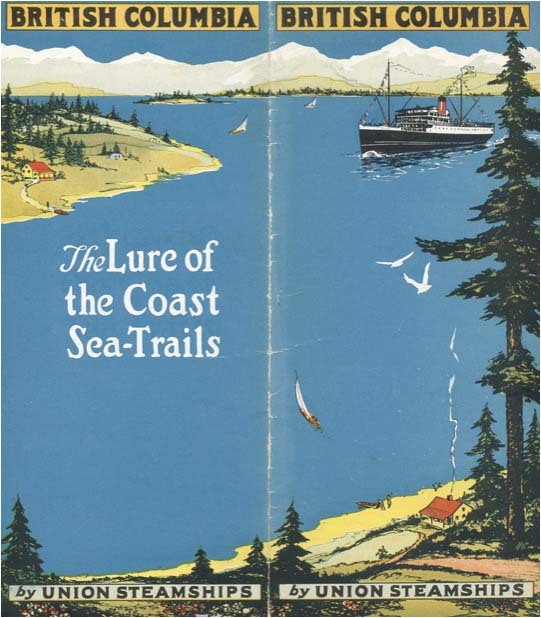 Later in life, she walked most days with her dog from Fairweather Bay to Seymour Bay. 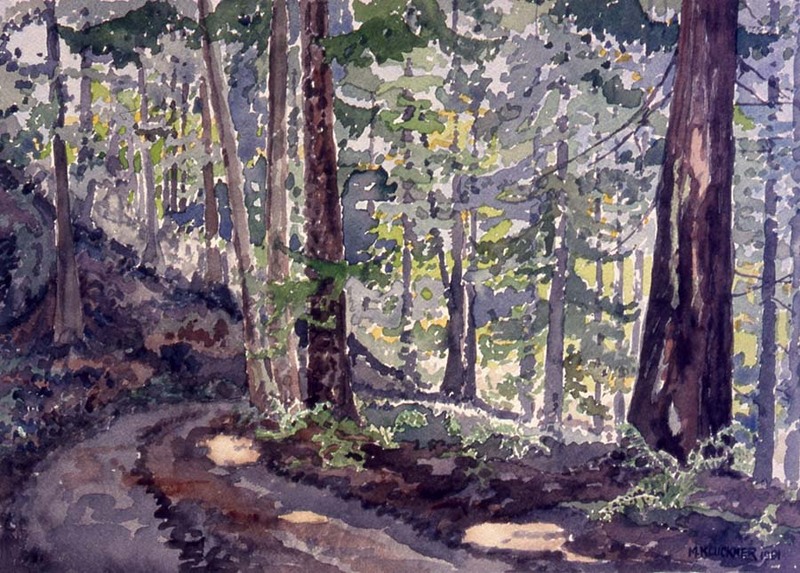 This "Janey's Walk" became the subject of a set of small watercolours I painted for her to have in her home in Victoria. 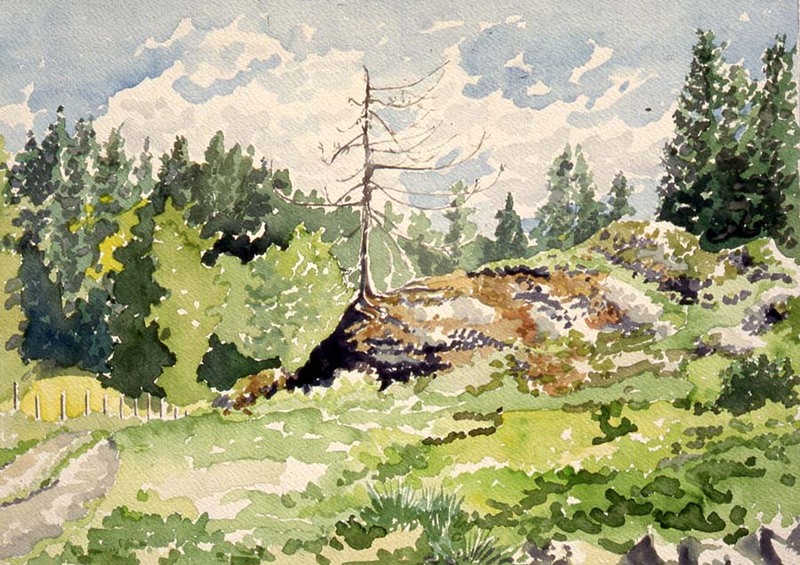 Near Seymour Bay, where the forest opened up into meadows. The cottage of J.P.D. Malkin (younger brother of the more-prominent W.H. Malkin of the wholesale food company and Vancouver mayoralty) at Cowan's Point looks across to the towers of UBC and Vancouver's West End. The back part of it, on the right, is a B.C. Mills prefab from 1906; Dominion Construction added the front wing and porch in 1918. It sat on 15 acres of rolling meadows along a rocky shoreline. A lovely spot – I wonder if it's still there? It was home to J.P.D. 's daughter Ursula, a one-time concert pianist, when I visited in 1989. 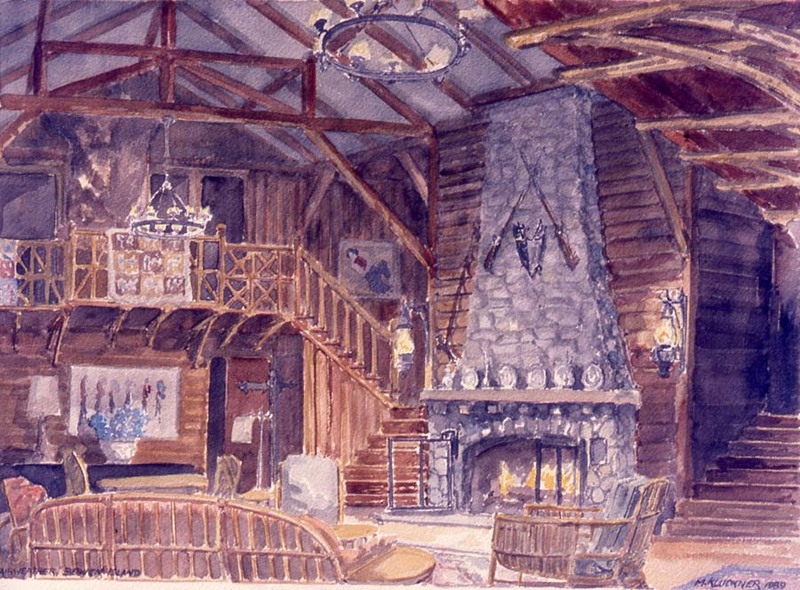 This, to me, was always the real Bowen heritage – the rustic place set picturesquely in paradise. Nothing like it being built anymore on Bowen, alas. 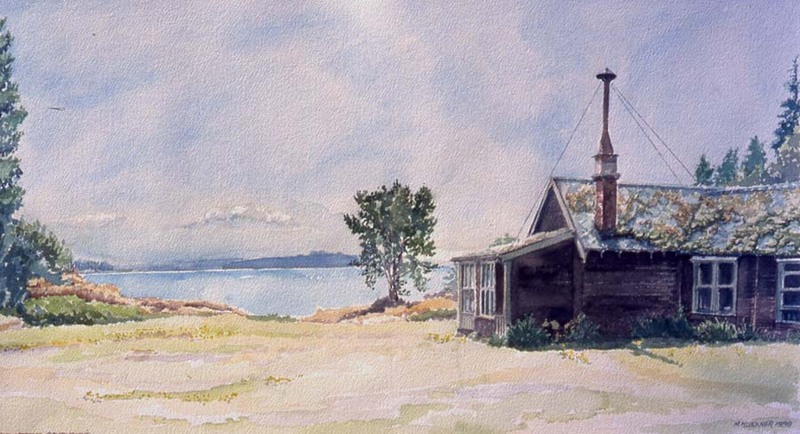 Written/sketched 2003: Bowen Bay is my favorite harbour on Bowen Island, as it has a little bit of flat land and a few modest cottages evocative of the good ol' days. The jetty extending into the bay, where I sat to paint this picture, is the jumping off point for Hermit and Pasley Islands (Tupper and Bell-Irving family histories). 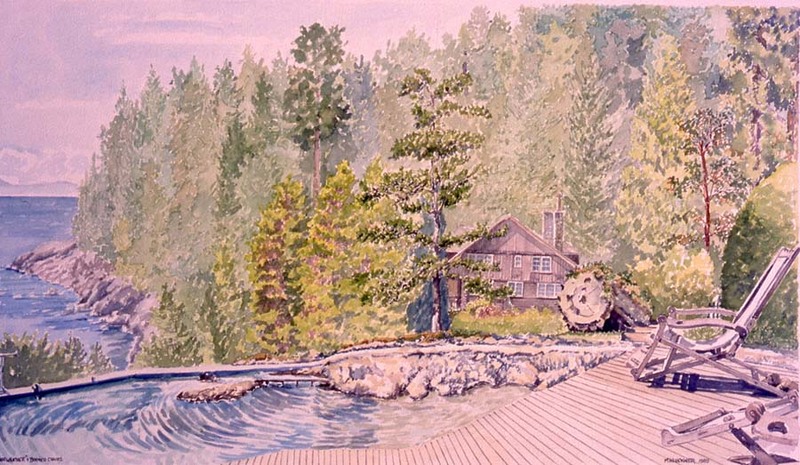 Most of the rest of the Bowen Island shoreline is, by comparison, very steep and rugged, offering dramatic building sites for the new generations of expensive, large, year-round houses. I have never been able to find anything about this place.